It is noted that the picture was brought to Macron with the permission of Roman Suschenko's wife Anzhelika. 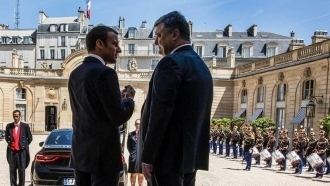 During his visit to France on June 26, Petro Poroshenko handed the country's President Emmanuel Macron a painting by Ukrainian political prisoner Roman Sushchenko, who used to work as a special correspondent in France, the Press Secretary of the Ukrainian President Svyatoslav Tsegolko informed on Facebook. Tsegolko stressed the demand of Ukraine: The journalist must be released. It is indicated that, earlier the wife of Roman Suschenko Anzhelika appealed to the first lady of France Brigitte Tronier with a request for assist in the release of her husband. Reportedly, on Tuesday, June 27, the Lefortovo District Court of Moscow is to consider the petition by the prosecution to extend the detention term of the illegally detained Ukrainian journalist. Reference: Special correspondent of Ukrainian news agency Ukrinform in France Roman Sushchenko was arrested in Moscow on September 30, 2016 and accused of espionage in the interests of Ukraine. He is kept in the Moscow prison Lefortovo.